Shield parted per pall reversed; above right Azure a throughout facetted cross Argent; above left Or, issuant from a triplemount Vert an embattled tower Azure; in base Argent a grapevine Azure with branch and two leaves Vert. Rauenberg gained the rank of a city in 1972, when the municipality of Malschenberg and the city of Rotenberg had been incorporated. The dexter field is representing Rauenberg. Its arms had displayed the same cross with four additional fleur-de-lis Or, one in every quarter. The field is also representing the Bishopric of Speyer, to which all parts of the city belonged until 1803. The sinister field displays the arms of former Rotenberg city, according to heraldic rules in different tinctures. The field in base displays the arms of former Malschenberg municipality. 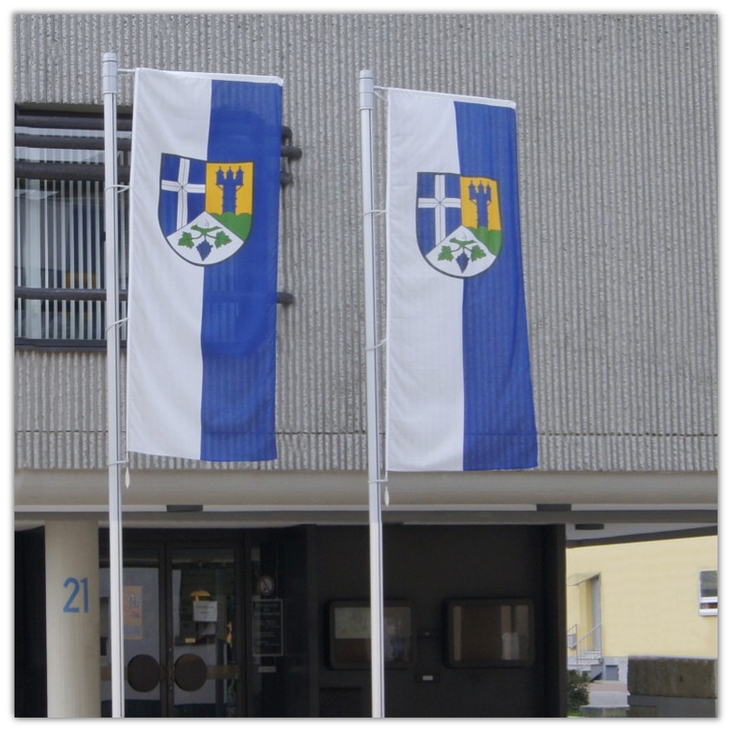 Banner and arms were approved on 13 April 1984 by the county administration, published in GABl 402/1985. Shield Azure, on a triplemount Vert, which is issuant from base an embattled tower Or. Castle and market town belonged to the Bishopric of Speyer since the middle of the 13th century until 1802. In 1338 Emperor Ludwig the Bavarian granted city rights, which remained however partly defunct. For this reason the existence of first seal couldn't be proven before 1499. The arms are based on this seal. The city rank was lost in 1935 and regained in 1956.